Florida Laser Service has been in business over twenty years. We specialize in upgrading, maintaining and supplying SERVICE PARTS for laser systems used in Business and Industry. We offer Service Contracts on most systems, including those made by Chicago Laser Systems (CLS), Electro Scientific Industries (ESI), Lee Laser, General Scanning, Teradyne, and AB Laser. Whether you have an Nd:YAG, Diode, or CO2 laser, we can help you. We offer service contracts designed to meet the needs of your business. For those not desiring a service contract, we do service calls on a time and material basis. Phone Support is available 24/7 at the rate of $150.00 per hour for non service contract customers. A Purchase Order is required at the time of phone support. If repair parts are purchased from Florida Laser Service within 5 days, the phone support charges will be waived or applied to the cost of the repair parts. Florida Laser Service has many hard to find parts that are required to service your CLS laser systems. Check our new Service Parts pages for information on our recently acquired Blade Probes, 8X and 12X eyepiece input lens, and probe assembly replacement cables. Quantity discounts are available on the Blade Probes. CLSProTM is a Windows based software application which allows users of CLS/ESI Option E+ Laser Trimmers to eliminate the need for the obsolete Sony System and User disk drives by replacing them with a PC. On the CLS 33 Zilog computer and CLS 37 PC152 CPU card, we add a Pentium III PC running Windows 98 to down load the CLS37D Operating System and trim jobs into the laser trimmer . This eliminates the requirement for the aging unrepairable 8" diskette drives. We also offer a 1.8Ghz dual core PC running Windows XP to replace your AT style PC on CLS960s. We offer a variety of re-furbished laser systems for sale at a reasonable price. 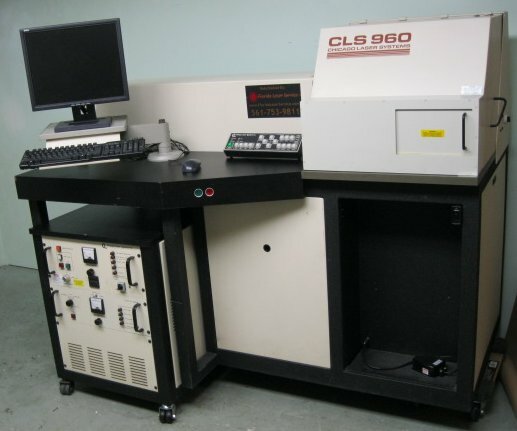 We also buy previously used Chicago Laser System (CLS) lasers. We have the capability of replacing your Electroglas step and repeat table with a state of the art solution. If your CLS33, or CLS37, are now using the Electroglas step and repeat system, you will be interested in our Baldor / Northern Magnetics (Normag) upgrade option. We have a very large inventory of replacement parts for ESI, CLS, and many other laser systems. Contact us for details. To be added to our mailing list, please fill out our mailing list request form.